Amazon Filters reports on how a leading Animal Healthcare company has made significant time and cost savings through implementation of a SupaPore 16FPW microfiltration system for bioburden control on its 100 m3 batch production of an enzyme added to chicken feed. The customer was originally using a 10-inch pre-filter and final filter combination for bioburden control from a different supplier. Using this set-up not only were bioburden levels of filtered product variable but they also typically had to use 1 filter for every 100 liters of product meaning huge replacement filter costs, long batch filtering time and lots of downtime for filter changes. 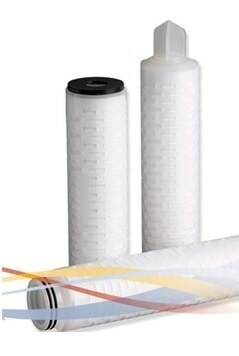 Amazon Filters offered and trialed its SupaPore 16FPW filter as a replacement solution. Widely proven in bioburden control installations, the SupaPore 16FPW being a pleated depth filter offered greater filter life and better throughputs than the existing system. Using a 10-inch version of the SupaPore 16FPW in its trials the customer was able to reduce filter changes to just 3-4 filters per batch. On Amazon Filters recommendation the customer has implemented a multi round filtration housing enabling them to run a whole batch through in a single pass. Not only has this produced a consistent sterile grade enzyme product but it has also reduced downtime, filter usage and processing time enabling the customer to make significant time and cost savings. The advanced borosilicate glass microfiber media used in SupaPore FPW microfiltration cartridges was selected due to its enhanced depth characteristics and exceptionally low-pressure losses. This is combined with a downstream polypropylene media to support and strengthen the system. This highly efficient media combination is stable even in the most severe CIP (Clean In Place) systems. The optimized pleated depth media offers high flow rates, excellent dirt holding capacity and superior retention levels. Manufactured using polypropylene for the hardware, the SupaPore FPW construction utilizes a thermal welding technique to seal all the components therefore eliminating adhesives and extractables and optimizing cartridge integrity. Its high filtration efficiency and dirt capacity makes it an excellent choice for use in almost all bioburden control processes.